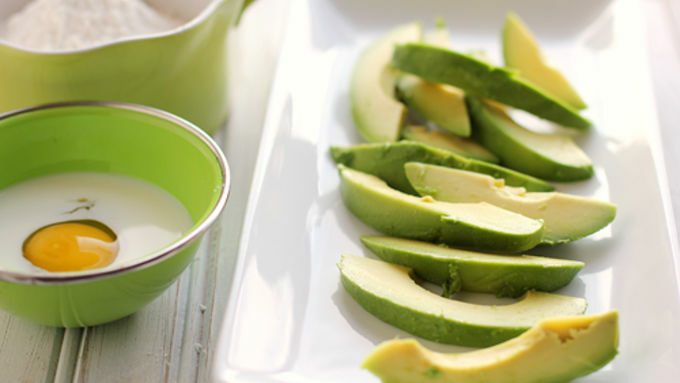 Halve, core, and slice the avocados into long, thin pieces. In a small bowl, mix together the Bisquick™, red pepper flakes, and galic salt. In a second small bowl, whisk together the egg and milk. Transfer 2 tablespoons of the milk mixture into the Bisquick™ mixture. Stir until the Bisquick™ becomes coarse and crumbly. Pour the remaining milk mixture over the avocados. Heat the oil in a medium saucepan over medium-high heat. 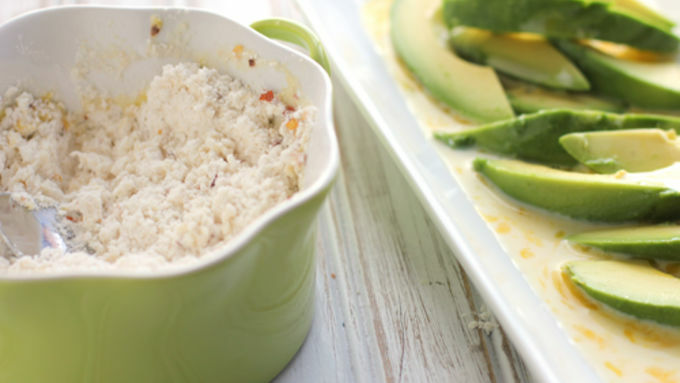 Gently transfer the avocados from the milk mixture into the Bisquick™ crumbs. Press lightly to coat each slice of avocado with the crumb mixture. Slide the crumb-coated avocado slices into the hot oil. Fry just until the outer coating turns golden brown. Remove from the oil and transfer to a plate lined with a paper towel. In a small bowl, stir together the lime juice, ranch, and cilantro. 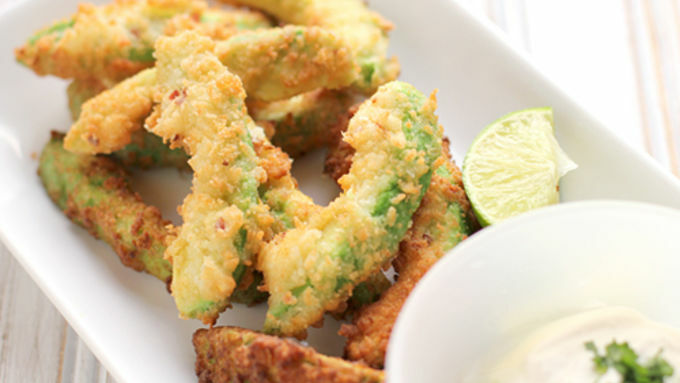 Serve avocado fries immediately with Cilantro-Lime Ranch Dip. 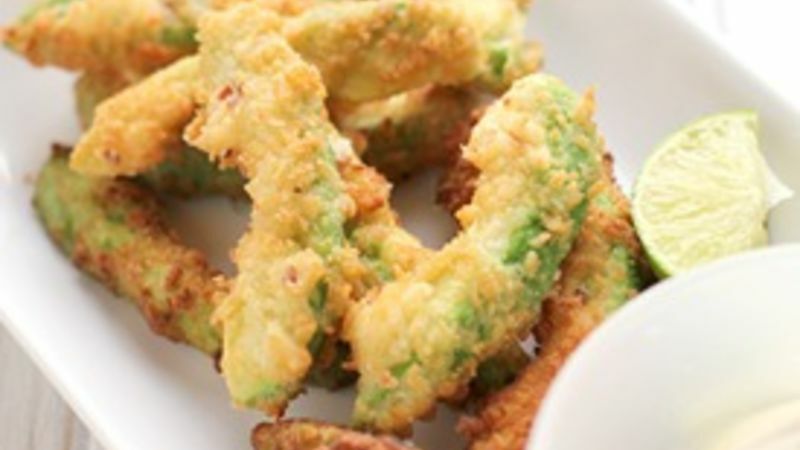 Avocado Fries are the ultimate snack. When I was a kid, there was a teensy little concrete restaurant down the road from our home. The windows were always adorned with handwritten weekly specials, there was a buzzer that dinged when you walked inside, and a single booth in which to eat. It was pretty small town America. We’d ride our bikes down to buy a snowcone or burger. But, when the restaurant started offering fried vegetables, my mom (the original health nut of all time) actually started dragging us down there for what she called, “totally irresistible” fried mushrooms and zucchini. Those snacks didn’t much fit into mom’s perpetual diet, and this one probably wouldn’t either. But, inspired by those fried veggies of yesteryear, I took the kitchen to pull together a batch of incredibly sublime Avocado Fries. As if a golden brown, crispy coating isn’t enough to make you swoon for a month, I paired our fries with a Cilantro-Lime Ranch Dip that so beautifully complements the creamy warmth of the fries with a kick of zingy flavor. Enjoy! Get your veggies in a tasty way! 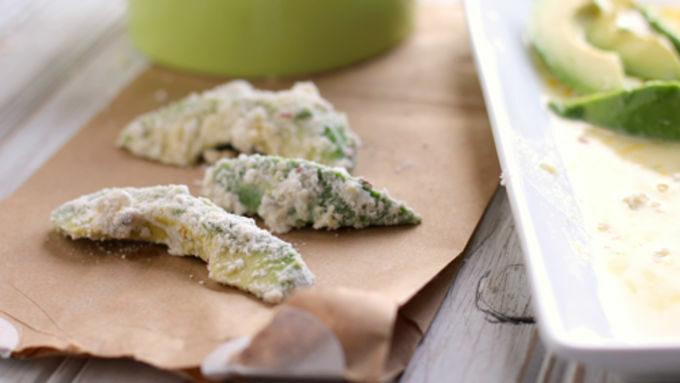 Thesevegetable recipes are great for snacks, sides or appetizers.